Ink degasser for 8-channel bulk systems. 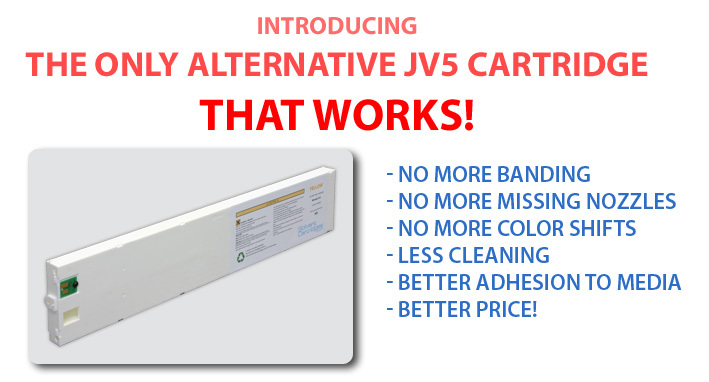 Can be used on Mimaki, Mutoh, Roland and any other inkjet printer equipped with a bulk system. 440ml cartridge filled with solvent-based flushing solution. Plug-and-play 440ml cartridge for Mimaki JV5 filled with premium solvent ink. This alternative ink runs flawlessly on a JV5 without nozzle drop-outs. Bulk system for Mimaki JV5 with ink bags and permanent chips. This system eliminate any possible contact of ink with air, ensuring a great reliability and quality of printing.